If you want to make some up like mine here are few tips for supplies. 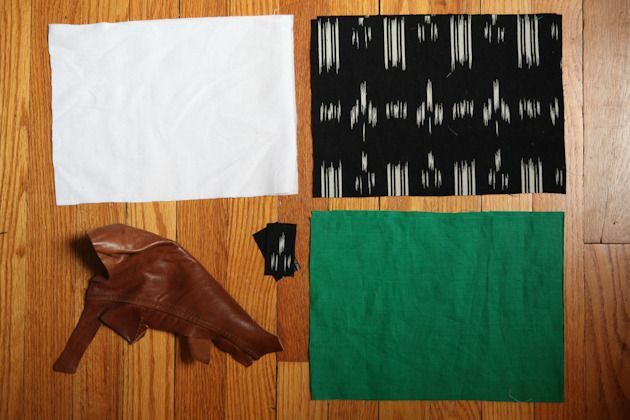 I think the best combos for these are natural fabrics. All of the outer fabrics above are linen. 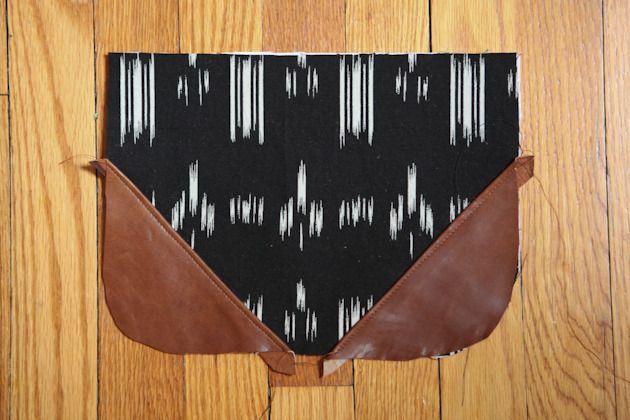 I think that the texture of a natural fabric like that paired with leather is always an impressive combo. If you do not have leather scraps around like I do (I am always on the hunt) I would first check your local thrift store. I have found some really great old purses or jackets that I have cut up for projects like this and for a few bucks a pop it goes a long way. I also often buy leather from this etsy shop. They have tons of colors and you can buy a small square for around $6 -$10 which would make a bunch of these little bags. I also used metal zippers on all of my bags too. Certainly not necessary, but I think for an extra dollar spent on a zipper the impact is much more impressive . OK, let’s get started. 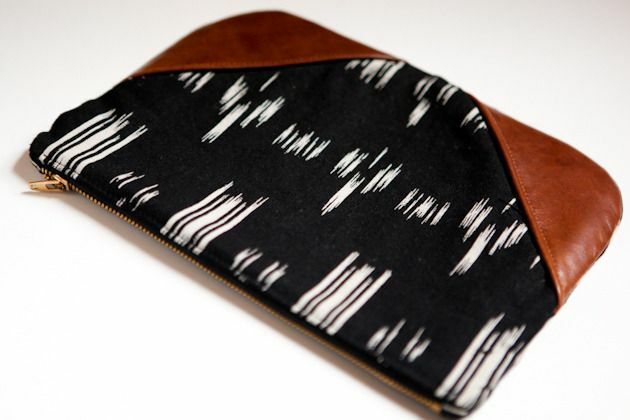 The tutorial below is to make a pouch that is about 10″ wide and 7″ long, but you could easily adjust the size for your preference. 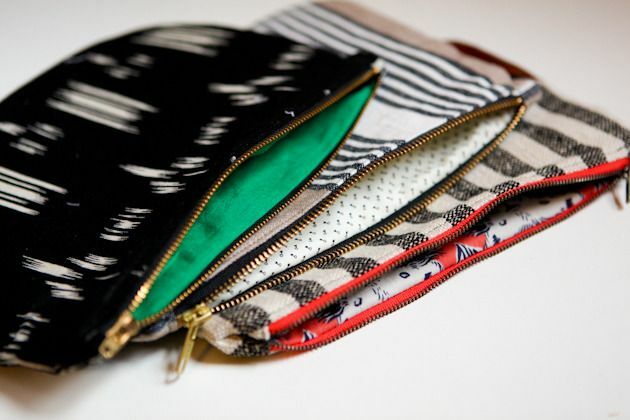 Just know that your zipper should be about 1 inch shorter than your desired width. 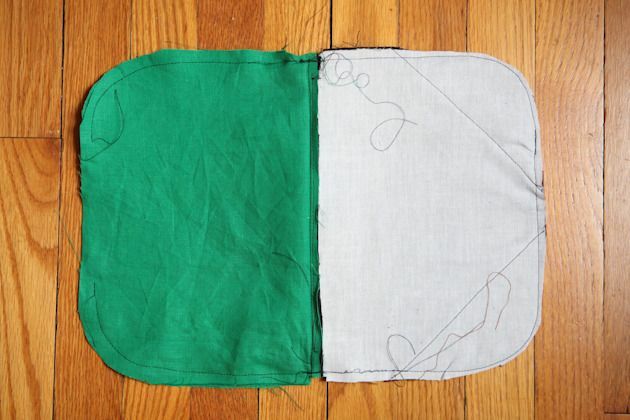 Apply fusible interfacing to the wrong side of both main 11″ x 8″ pieces. 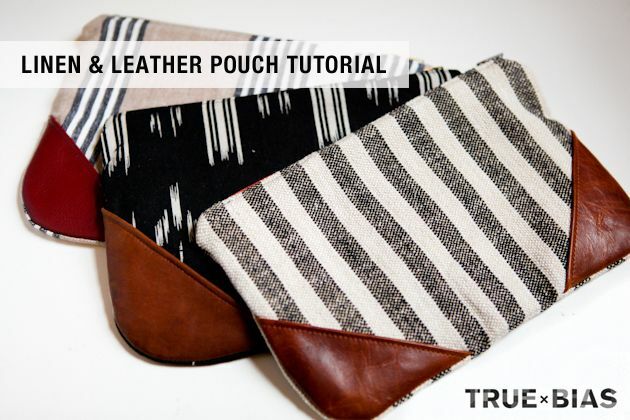 Take your leather scraps and cut two (they are only on the front of the pouch not the back) so that the corners match the main pieces and other edge is at an approximate 45 degree angle from the bottom. Once again I just eyeball this so each one is a little different. 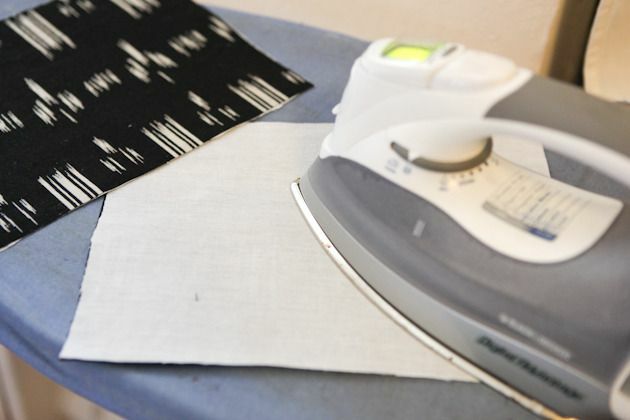 Fold under the the angled edge by about 1/4″ and either use a bone folder to press the fold or an iron without steam. You could also just leave this edge raw and not fold it under, but my leather was soft enough that I could fold it. 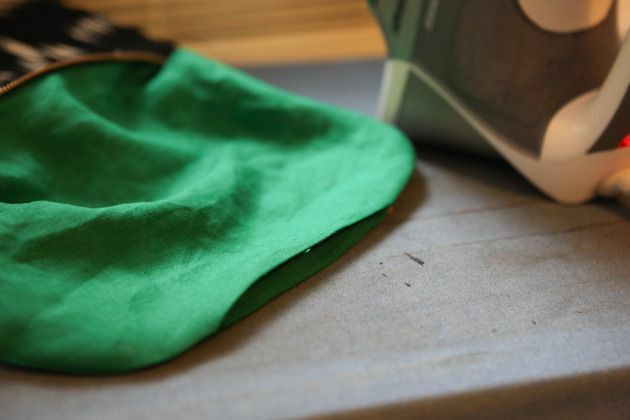 I have found that I like to put a hot iron on the fold and hold it there for a few seconds to really get a good crease. I also usually use a glue stick to attach the leather to the main piece and let it dry. This really helps it to stay in place when stitching in the next step. 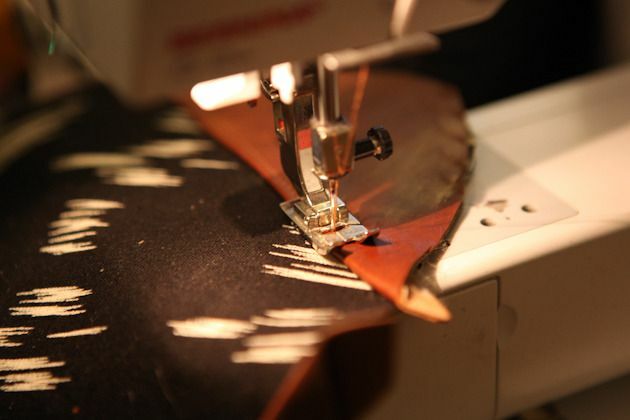 You could also use clamps, but do not use pins as they will puncture your leather. Put your leather / jeans needle in your machine. I leave it in for the entire process of making this bag as I find that the multiple layers needs a really strong needle to sew it well. 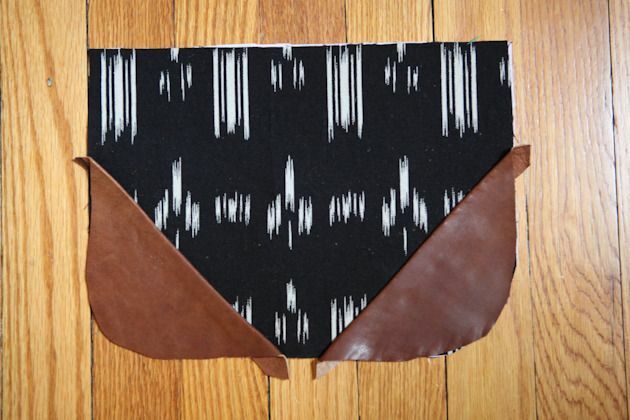 Now stitch about 1/8″ inside of the folded, angled, leather edge. I use a slightly longer stitch length and matching brown thread (although you could also use the same thread you are using for the rest of the bag for contrast). 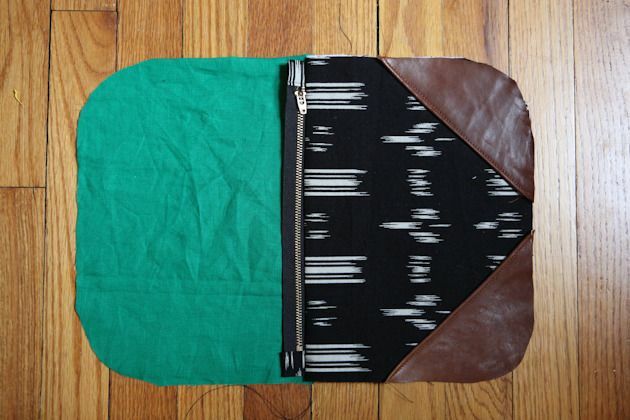 Prepare your zipper tabs by folding each of the short ends in by 1/4″ and pressing. 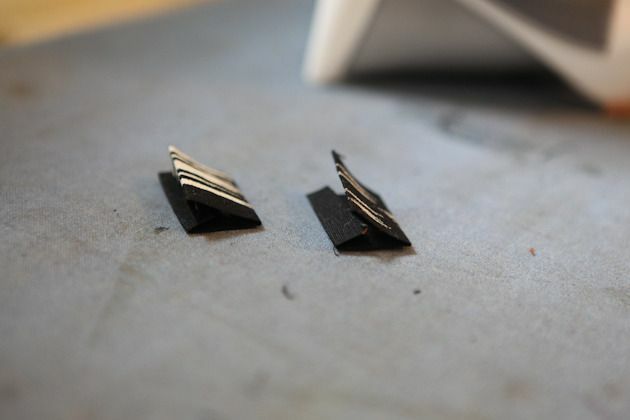 Then fold in half so that the 1/4″ folded edges are now touching one another. Press. 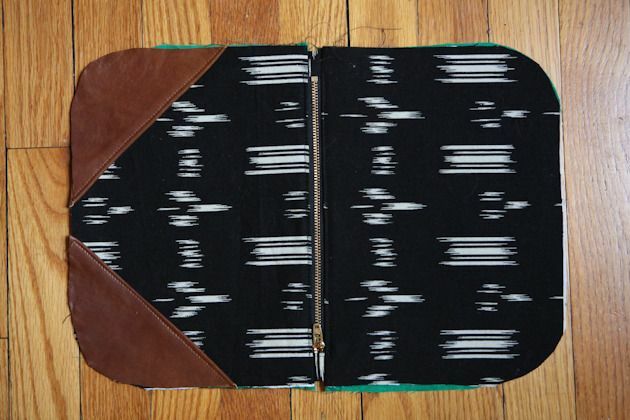 Put each zipper end inside of the folded tab. Pin. 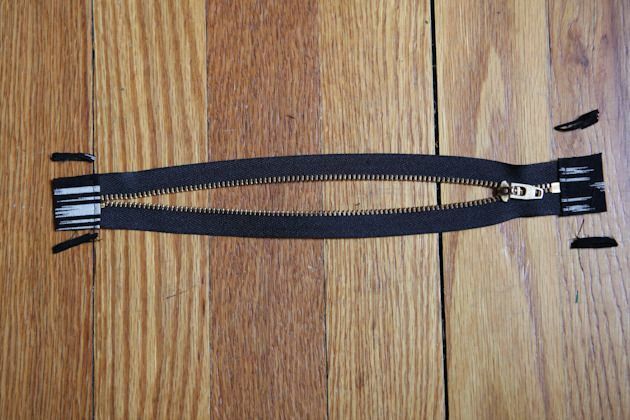 Put on your zipper foot and stitch about 1/8″ inside of the folded edge next to the zipper stop. 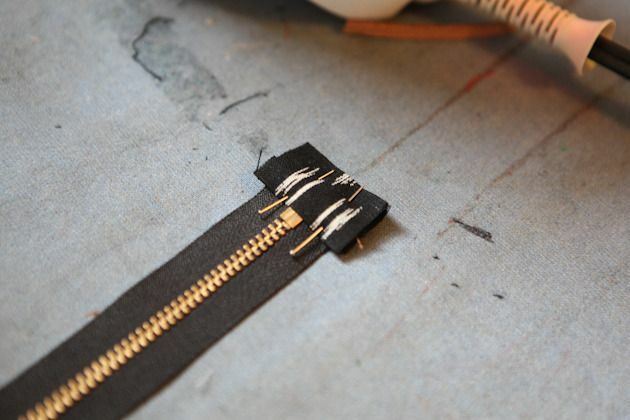 Trim off any excess on the sides of the zipper tape. Lay one main piece face up and then lay the zipper on top face down. Put one lining on top face down. Pin the top edge. 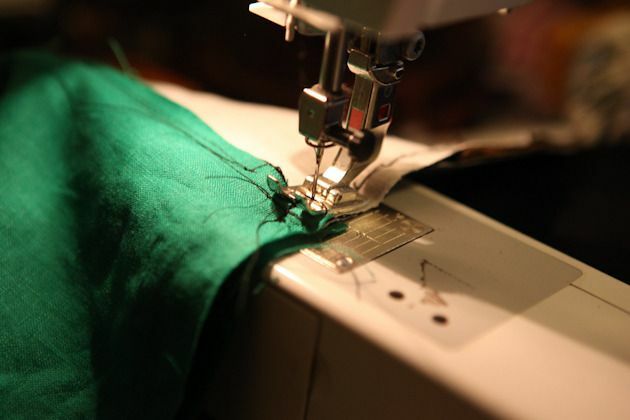 Using your zipper foot, stitch along the top edge near the zipper teeth from one end to the other. 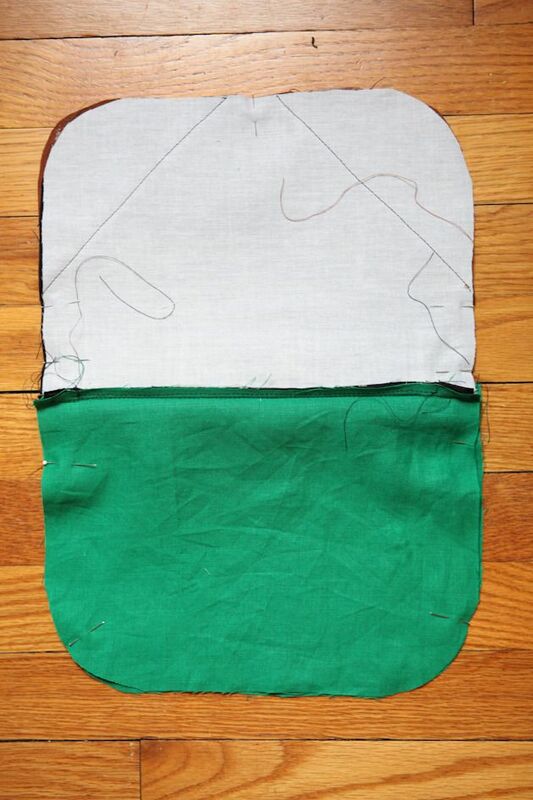 Press the seam allowance and main fabric to the right and the lining to the left. Edgestitch along the fold of the main main fabric next to the zipper tape from one end to the other. Press the lining back under the main fabric to the right. 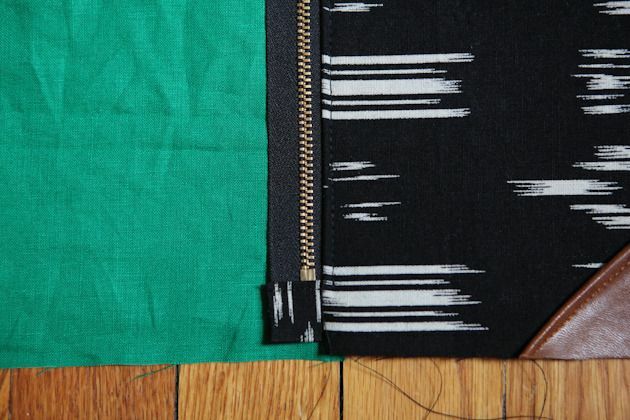 Repeat process for other side of zipper tape with remaining main and lining pieces. Open up your zipper. Pin the main pieces together, right sides touching – do not pin where the leather is so that you don’t leave holes in your leather. 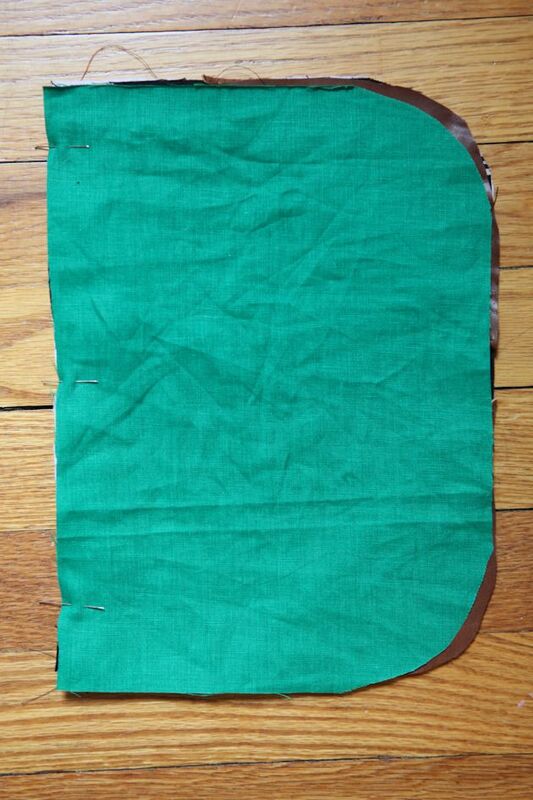 Pin the two lining pieces together, right sides touching. 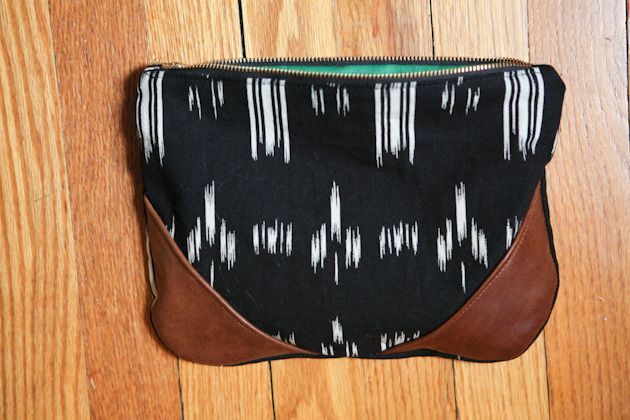 Leaving a 5″ opening in the bottom of the lining, stitch all edges at 1/4″ seam allowance. This is especially tricky and thick where the zipper tab is. Let the bulk of the tab fold towards the lining. Just go slowly and go back and forth a few times over this spot for reinforcement. 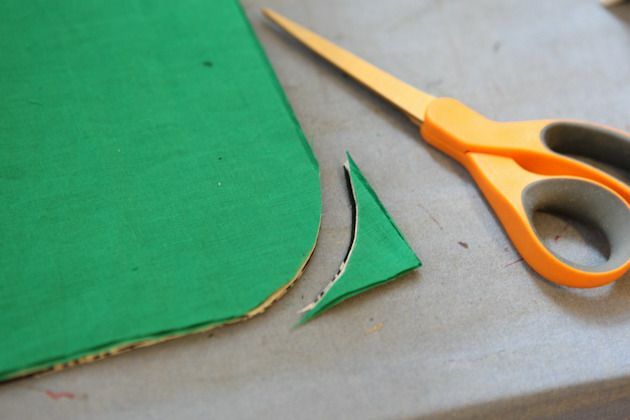 Trim the seam allowance, especially at the zipper tab and around the leather pieces. 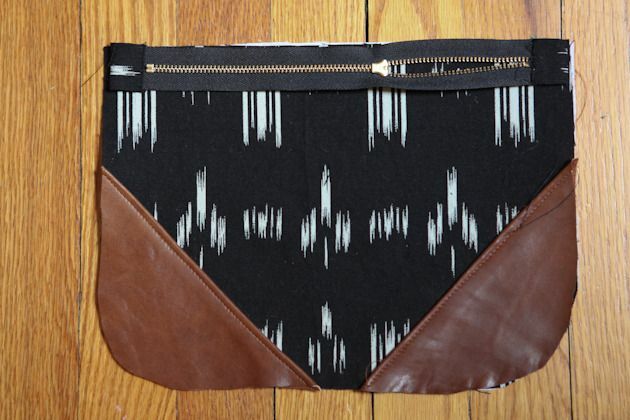 Turn your pouch right side out through the opening in your lining and the open zipper. Work the corners at the zipper until you get a decent angle ( I sometimes use a chopstick to help with this). 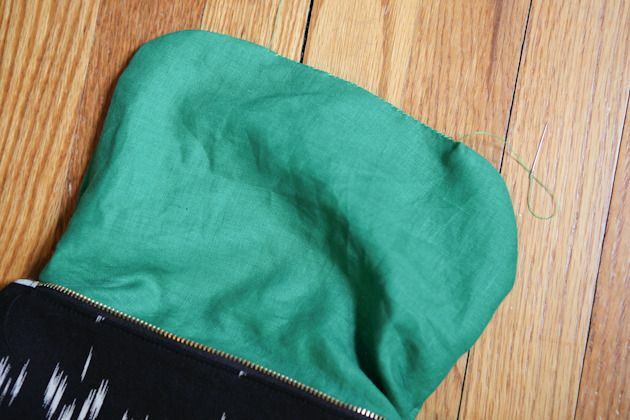 Pull the lining back out of the zipper and give it a good press, pressing in the 1/4″ seam allowance at the opening. Either machine or handstitch the opening closed. Put the lining back inside and give the entire pouch a good press. All done! Thanks for posting this. I am trying to gather ideas for mothers day. Although I might make a couple of these to hold diapers and wipes for some new mothers. (adjusting the size of course.) Thanks for sharing the how to! These are great! I love your linen fabrics and that green lining is so fun! For the first time ever I’m a little sad that I’m your sister and not your mother. 🙂 Fabulous! This is really a cute idea. Thanks for the tutorial. These are fabulous! Are they for sale?? This is such a helpful tutorial! My sewing skills are… well I have no skills, just a cross my fingers and fake it, sort of thing.I appreciate all the pics, details and hints! I’ll be picking up some leather at V.V. and give these a try. Thank you! Thanks so much for sharing this little tutorial! It couldn’t have come at a better time for me, I bought a bunch of leather remnants and have been humming and hawing about what to do with them cause the pieces are so oddly shaped. This is perfect! Great idea for last minute presents. They look very chic too. Wow! Can’t believe you made that yourself…they look awesome! These are beautiful and they look so professional! I’m new to sewing and I’ve never used interfacing before. What kind did you use on these?